The Seventh Annual Glass Slipper will be held Saturday, April 18, at Combined Community Services, 1195 Mariners Drive, Warsaw. This year there will be two different times for the event, an early afternoon shift and an early evening shift. Cailin Clay is hoping this will allow more girls to attend by offering times that coordinate with work schedules and extra-curricular school activities. The event is by invitation and sign up sheets are available at CCS. Any Kosciusko County student may sign up. At the event, dresses are available to choose from and gift certificates for meals or alterations are distributed. In the past, many restaurants have provided prom meals and volunteers have provided alterations. The event was started by Alexis (Lisenbee) Light. She had attended her prom and heard several students talking at lunch the following Monday about not being able to go because of the cost of the dress and other typical preparations. She asked if CCS would be willing to sponsor the event and asked a friend, Katy (Cobb) Anderson to help. The first Glass Slipper was held the Spring of 2009. In order to keep the drive going after graduation, they asked for help from then eight grade students, Lacey Lisenbee and Ashlyn Vitoux, who took over full coordination of the drive in 2013. Lacey and Ashlyn asked Cailin and MegAnn Pearl to be a part of it in 2014, and this year Cailin and MegAnn are in charge of the event. This is actually the first year that none of the original coordinators will be involved. CCS needs anyone who wants to do simple alterations, provide a prom meal or do make-up and hairstyles for students throughout Kosciusko County on their specific prom day. Proms are on different days and it would be helpful to find people in each town. Fiesta Salon provides hairstyles for Warsaw Community High School students who attend the event. If people are interested in those things, email Peggi Wright at [email protected] or Cailin at [email protected]. Appreciation is expressed to everyone who has already donated dresses, shoes and jewelry. We are still seeking dresses in all sizes. Some of the provided dresses. 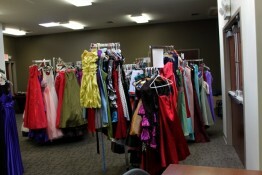 Volunteers bag a chosen prom dress with bags provided by Wildman Business Group.